A 200-hour lip seal test at 1,500 psi and 136 sfpm - Kalsi Engineering, Inc.
We began marketing KLS® lip seals for 1,000 psi dynamic service in oilfield rotary heads after testing them at a speed that is equivalent to a 10.375” mandrel rotating at 200 rpm. We continue to explore the capacity of this unique seal, and have now completed two 1,500 psi tests. Both 1,500 psi tests were conducted at a speed of 136 surface feet per minute (sfpm), which is equivalent to a 10.375” mandrel rotating at 50 rpm. Intermittent computer-controlled coolant circulation was used to maintain the bulk lubricant temperature at about 150 to 160°F. This moderate cooling is intended to simulate the cooling the lower end of the mandrel of a rotary head receives from exposure to drilling fluid. The tests were conducted on a nickel-based tungsten carbide coated running surface and used an ISO 460 viscosity grade seal lubricant. 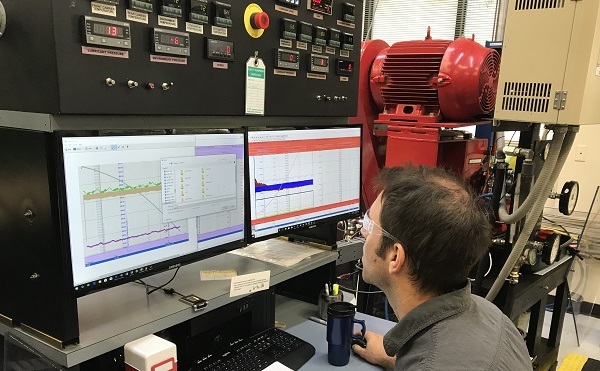 The goal of the initial 1,500 psi test was to see if a KLS seal could meet the 100-hour minimum test duration established by API 16RCD, “Specification for Rotating Control Devices”. After seeing the good condition of the seal from the initial test, we immediately began a second test. The goal of the second 1,500 psi test was to see if a KLS seal could meet the 200-hour testing goal established by API 16RCD. We stopped the test at 207 hours to inspect the seal, and found it to be in excellent condition. The average hydrodynamic pumping-related leakage was 2.3 ml/hr. As expected, the direction of this leakage was from the unpressurized seal lubricant into the 1,500 psi fluid. Both tests were performed with 3.375” PN 668-4 seals. We are currently preparing to test 10.50” seals on our full-size RCD seal test fixture. KLS seals are spring-loaded lip seals that have a composite plastic-elastomer construction. The spring provides the initial sealing force between the seal and the mating surfaces of the mandrel and seal housing. The inside and part of one end of the seal are lined with extrusion-resistant plastic that incorporates hydrodynamic waves. These waves are exposed to lubricant, such as the bearing lubricant of a rotary head. Differential pressure causes a portion of each wave to contact the mandrel. When the mandrel rotates, these waves wedge a small amount of lubricant into the dynamic sealing interface. This lubrication improves seal performance dramatically. In an oilfield rotary head, KLS seals are tasked with containing pressurized drilling fluid, which is highly abrasive. Lip seals do a much better job of sealing abrasive fluids when the differential pressure acting across the seal is low. This means that the best way to employ KLS seals in rotary heads is to use them in pairs, and balance the pressure of the lubricant between the seals to the pressure of the drilling fluid. The pressure balancing can be accomplished by using small pistons or diaphragms. This arrangement isolates the outboard seal (the “barrier seal”) from differential pressure, so it can better-resist the abrasive content of the drilling fluid. Click here to read about the excellent abrasive exclusion of the KLS seal in near-zero pressure differential conditions. Give us a call at 281-240-6500, or send an e-mail, to learn more about using KLS seals in your rotary drilling heads. To review existing off-the-shelf seal sizes, click here. New sizes can be made upon request. This photo shows the excellent condition of the dynamic surfaces and hydrodynamic inlets of the PN 668-4 KLS seal after the 207-hour, 1,500 psi test at 136 sfpm. The test was performed to gain insight about the use of a KLS as a rotary head seal. In this photo, Senior Engineer Aaron Richie is transferring test data following the rotary test. The sloping gray line on the left-hand graph represents the pumping rate at which the low-pressure seal lubricant was pumped into the high-pressure fluid. The seal test fixture is the red machine on the right. This is an end view of the used PN 668-4 KLS seal after the 1,500 psi rotary test. The V-spring that can be seen here is used to load the sealing lips against the mating surfaces of the seal housing and the rotating mandrel.